THE PRESIDENT: Hello, everybody! (Applause.) You all clean up pretty good. (Applause.) You are looking good. Couple of acknowledgements I want to make — first of all, please give it up for DJ Mel Sandico. (Applause.) The U.S. Army Band is in the house. (Applause.) We’re so proud — they can play anything — anything. Go ahead and make a request, they’ll play it. They are outstanding. And we are so grateful for their service to our country each and every day. 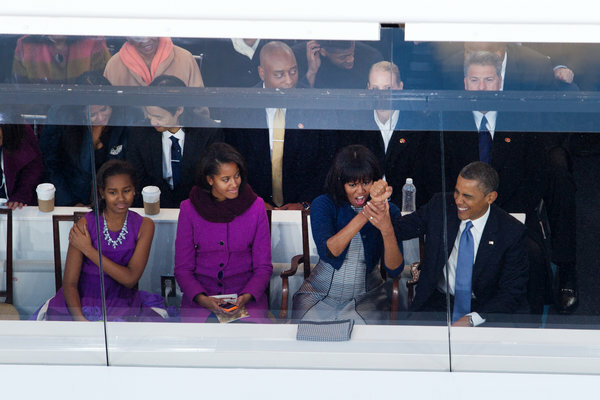 MRS. OBAMA: This has been a great inauguration. They’ve done a great job. THE PRESIDENT: Michelle just said this has been a great inauguration, and you’ve done a great job. We’ve got the DNC convention team that did an amazing job. (Applause.) We’ve got the DNC team that did an amazing job. (Applause.) And we’ve got the White House team, which is pretty good. (Applause.) They did an amazing job. Now, I’m not going to speak long, mainly because I’ve been speaking a lot and you all have heard me before. MRS. OBAMA: And the entertainment is pretty good. THE PRESIDENT: But regardless of whether you got involved six years ago or you got involved six months ago, what is true is that all of you have come to represent for me and Michelle our deepest hopes for America. THE PRESIDENT: — get some loans to repay. You may be making a whole range of career choices and decisions right now. And, look, not all of you will end up staying in politics. Not all of you will end up pursuing professionally public service. But every single one of you, in your communities, in your neighborhoods, in your workplaces, wherever you decide to put down roots, wherever you decide to make a difference, as long as you retain that spirit that you’ve shown during the course of these campaigns — the idea that you’re a citizen, that America only works when you make it work — (applause) — that you have the power to move this country and, as a consequence, the world — if you retain that sense and never lose it, then I tell you, not only is America going to be in good hands, but what’s going to happen is you’re going to influence your peers and your friends and the folks you live next to and your neighbors and people in your workplace. And suddenly, like Robert Kennedy described, you’re like a stone thrown in a pool and it starts rippling out. And you don’t know where those ripples are going to go, and that’s the future that I see for you. I know that every single person here donated $10 to a memorial on behalf of Alex Okrent Memorial. (Applause.) And Alex was one of you — this incredibly thoughtful, talented, compassionate, caring young person who decided to get involved because he thought he could make a difference. And tragically, he ended up leaving us while working in the campaign — some of the people here were there when it happened. And it was heartbreaking, and it reminded us of how precious our time on this Earth is. We don’t have a lot of time. I know when you’re young it seems like it goes on forever. It turns out things are fragile. And yet, the thing that outlives each of us is what we do for somebody else, what difference did we make. And we know Alex made a difference. (Applause.) And so his impact outlives him. And that means — that’s all right — somebody is over there and they probably fainted because they’ve been standing too long. Many of you have been at rallies — there’s one over here, we’ve got EMS folks here. People, bend your knees while you’re here. (Laughter.) And try to get hydrated as well. MRS. OBAMA: You know you’ve got to drink some water! But in the same way that Alex left this indelible mark on my life and Michelle’s life, and many of your lives, you will leave an indelible mark as well, as long as you decide that you’re going to spend your life giving something back. THE PRESIDENT: Are you ready to go? THE PRESIDENT: Ready to go. THE PRESIDENT: I think Lady Gaga is fired up, too. I’m not going to give a long speech. What I really want to do is come down and express the extraordinary gratitude not just of me as your Commander-in-Chief, but more importantly, the thanks of all the American people. I want to start by thanking some of our outstanding leaders who are here: our hosts, our Senior Enlisted Advisors from all five branches of our military. (Applause.) The Chairman of the Joint Chiefs of Staff, General Marty Dempsey, who promised to sing sometime tonight, so you should hold him to it. (Laughter.) The Vice Chairman, Sandy Winnefeld, and all our outstanding members of the Joint Chiefs. Our Secretary of Veterans Affairs and Vietnam veteran, Ric Shinseki, who is here. And we’re honored to be joined by some truly extraordinary Americans, our wounded warriors, who inspire us with their incredible strength and resolve. (Applause.) Our enlisted men and women and junior officers — the backbone of our military. (Applause.) Our amazing military families — (applause) — including the families of the fallen — our Gold Star families — we will stand with you always. Today, we experienced the majesty of our democracy; a ritual only possible in a form of government that is of, and by and for the people; a day made possible because there are patriots like each and every one of you who defend our freedom every single day. It’s because of you that with honor we were able to end the war in Iraq. Because of you that we delivered justice to Osama bin Laden. (Applause.) Because of you that it’s even possible to give Afghans a chance to determine their own destiny. We are going forward, and we’ll keep our military the finest fighting force that the world has ever known. Now, tonight, we’re also joined by some of our servicemembers in Afghanistan. They can’t see us, but we can see them on this monitor. Who we got there? General, are you there? Abe? MAJOR GENERAL ABRAMS: Sir, good evening. Mr. President, congratulations on your inauguration. It is Major General Abrams, commanding general of the 3rd Infantry Division and Regional Command-South. We’re honored to be able to join you there this evening. Sir, I’m joined tonight by some fantastic airmen and non-commissioned officers and soldiers serving here in Kandahar. SERGEANT JACKSON: Congratulations, Mr. President. Sergeant First Class Orlando Jackson from Lake Charles, Louisiana — 3rd Infantry Division, Falcon Brigade, Task Force Light Horse. I just wanted to congratulate you on a job well done. THE PRESIDENT: (Laughter.) Well listen, to all of you who are there, we know it’s tough being away from your families. We know the incredible sacrifices and challenges that you meet every single day. But I can tell you that you’ve got a room full of patriots here. (Applause.) And although I’ve got to admit that they’re a little spiffied up right now — (laughter) — their heart and soul, their dedication, their sense of duty is at one with every single one of the folks who are in Kandahar right now. And I want you to know that when I was standing on the steps of the Capitol today, looking out over close to a million people, the single-biggest cheer that I always get — and today was no different at my Inauguration — was when I spoke about the extraordinary men and women in uniform that preserve our freedom and keep our country strong. (Applause.) So know that every single day we are thinking of you. We’re going to make sure that you’ve got the equipment, the strategy, the mission that allows you to succeed and keep our country safe. Know that we are going to be looking after and thinking about your families every single day, and that when you get back home you’re going to be greeted by a grateful nation, and that you will be on our minds tonight and every single night until our mission in Afghanistan is completed. Given the statements made about President Obama’s second inaugural address, it appears that he won’t have an easy go of it with GOP lawmakers this term either. President Barack Obama and first lady Michelle Obama capped off more than three days of public inaugural events Tuesday with the National Prayer Service at Washington National Cathedral. 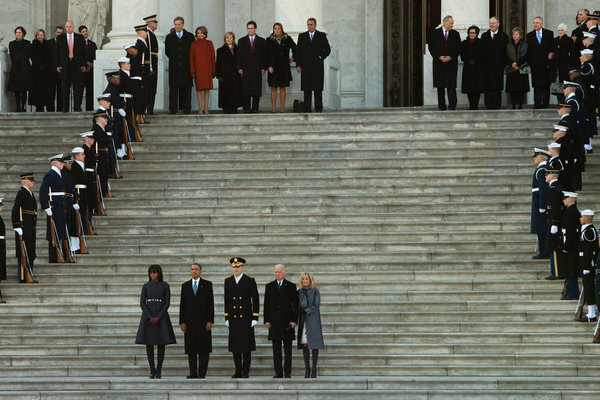 The Obamas were joined by Vice President Joe Biden and his wife, Jill. The service includes prayers, readings, blessings and hymns delivered by religious leaders from across the country. The Rev. Adam Hamilton, founding pastor of The United Methodist Church of the Resurrection in Leawood, Kan., was selected to deliver the sermon. 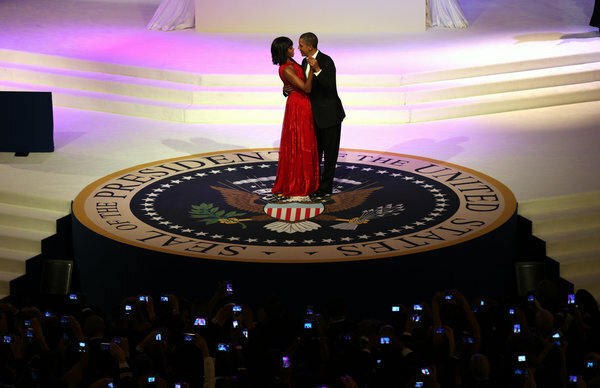 President Obama and first lady Michelle wrapped up their inauguration with a night of merrymaking. 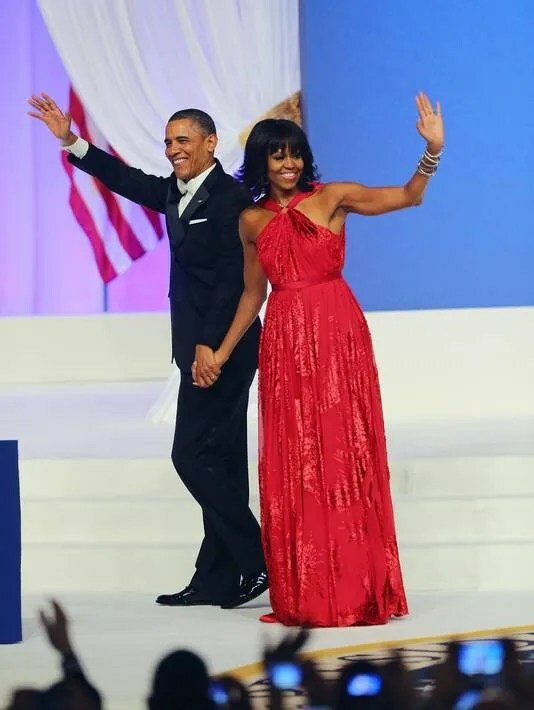 An elegant second Obama inauguration, packed with high-fashion, high-energy and high-profile stars, twirled to an end Monday as President Obama and first lady Michelle Obama — she in another stunning gown — danced the night away at the inaugural balls. 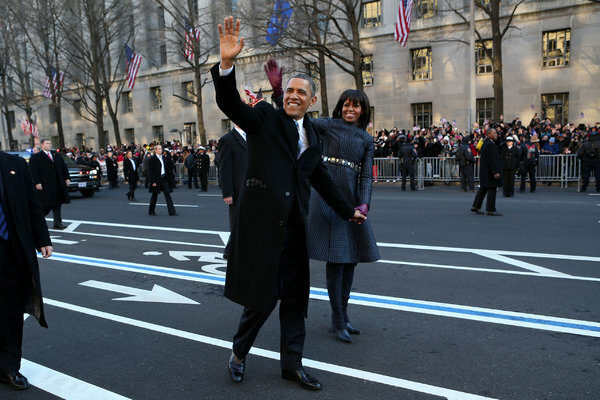 President Barack Obama and first lady Michelle Obama on Monday emerged twice from their limousine to respond to wildly cheering crowds along the inaugural parade route from Capitol Hill to the White House. 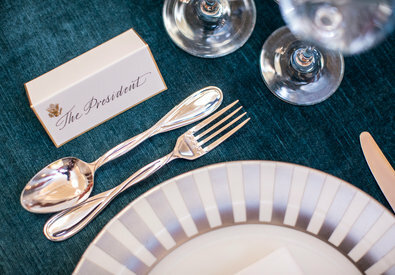 On Monday afternoon, President Obama and Vice President Joe Biden offered toasts during the inaugural luncheon. 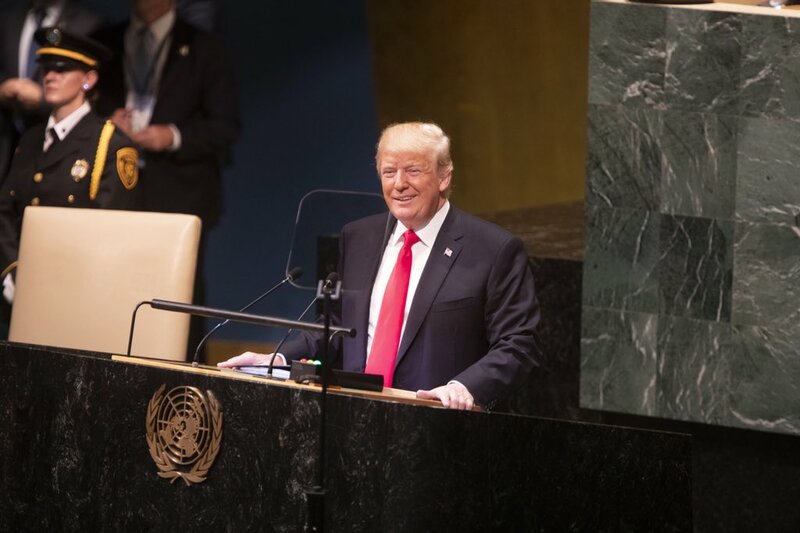 The president noted that while there were “profound differences” among those in the room, he was thankful for everyone’s service…. SENATOR SCHUMER: Mr. President, Dr. Biden, and your whole wonderful family, I now rise to toast the Vice President of the United States and my former colleague and my friend, Joe Biden. Mr. Vice President, you’ve been an extraordinary leader of this nation and a true partner to our President these past four years. You play many roles — advisor, advocate, implementer, persuader, strategist, and most important of all, friend. We’re confident this unique partnership between you and our great President will only grow stronger and more productive over the next four years. Mr. Vice President, on the surface, we don’t share a common ancestry, but on a deeper level we do share a common story, an American story, of achieving our dreams thanks to the sacrifice of our immigrant forebears. As you embark on your well-deserved second term, in the spirit of those who came before us, and on behalf of all Americans, we offer you all our support and warmest wishes, and we say to you — Sláinte. L’chaim. Salud. Cent’anni. And cheers. To our great Vice President. Presidents assembled — I always enjoyed this lunch more than anything we did in the Capitol. For the 36 years I served in the Senate, I had the great honor of being included in this lunch of former Presidents and Vice Presidents — because it really is the place where we get together in a way unlike any other time when we gather. It’s always a new beginning every time we’re in this room. And there’s a sense of possibilities and a sense of opportunity and a sense — sometimes it’s fleeting, but a sense that maybe we can really begin to work together. That’s what you’ve done throughout your career, and that’s what almost everyone in this room has done. At the end of the day, it’s an absolute confidence — absolute confidence — there’s not a thing, a single thing this country can’t do. I spent too much time with all of you not to know you feel it with every fiber in your being that there’s nothing – nothing — this country is incapable of. I must say the President kids me occasionally — I know Harry Reid always calls me a Senate man. I am proud to have been a Senate man. I am proud to be President of the Senate. But that pride is exceeded only by the fact I’m proud to be Vice President of the United States, serving as Barack Obama’s Vice President. It’s been one of the great privileges — (applause) — one of the great privileges of my life. 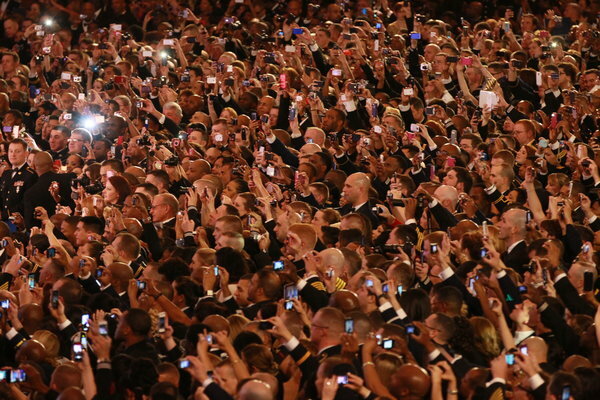 As a matter of fact, if the President will forgive me, as we were walking out and he was, as he said, savoring the moment, looking out at the crowd and all those Americans assembled, I found myself — surprised me, even — I turned to him saying, thank you. Thanks. Thanks for the chance. Thanks for the chance to continue to serve. God bless you, Chuck. You’ve done a great job. And, Lamar, you have as well. To Chuck Schumer. Good to see you, pal. SENATOR REID: Americans todays are wishing the President Godspeed for the next four years. People all over the world are looking at us, and our exemplary democracy, and wishing the President the best in the years to come. I’ve had the good fortune for the last many years to work on a very close, personal basis with President Obama. I’ve watched him in the most difficult challenges that a person could face. I’ve watched him do this with brilliance, with patience, with courage, wisdom, and kindness, for which I have learned a great deal. So, Mr. President, I toast and pray for you, your wonderful family, and our great country four more successful years. THE PRESIDENT: Michelle and the Speaker of the House came to a meeting of the minds that I may be delaying the proceedings too much. 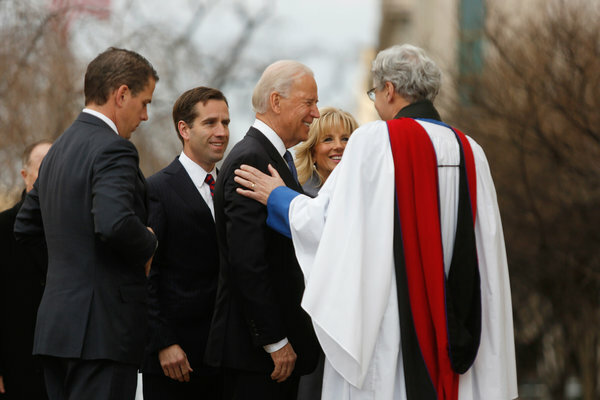 And so I’m just going to be extraordinarily brief and say thank you — to my Vice President, who has not only been an extraordinary partner but an extraordinary friend; and to Dr. Jill Biden, who has partnered with my wife with extraordinary generosity on behalf of our men and women in uniform. To the entire Cabinet that is here, I am grateful to you. Some of you are staying and some of you are leaving, but I know the extraordinary sacrifices that you and my team have made to try to advance the cause of progress in this country, and I’m always going to be grateful to you for that. To the Speaker of the House and Nancy Pelosi, to Democratic Leader Harry Reid, as well as Republican Leader Mitch McConnell, and to all the congressional leaders and all the members of Congress who are here — I recognize that democracy is not always easy, and I recognize there are profound differences in this room, but I just want to say thank you for your service and I want to thank your families for their service, because regardless of our political persuasions and perspectives, I know that all of us serve because we believe that we can make America for future generations. And I’m confident that we can act at this moment in a way that makes a difference for our children and our children’s children. I know that former President Carter, President Clinton, they understand the irony of the presidential office, which is, the longer you’re there the more humble you become and the more mindful you are that it is beyond your poor powers individually to move this great country. You can only do it because you have extraordinary partners and a spirit of good will, and most of all, because of the strength and resilience and fundamental goodness of the American people. And so I would like to join all of you not only in toasting the extraordinary work that Chuck Schumer and Lamar Alexander and others have done to create this special day for us, but I also want to thank each and every one of you for not only your service in the past, but hopefully your service in the future as well. Thank you, everybody. God bless you, and God bless America. “We must act; we must act knowing that our work will be imperfect,” said President Obama. 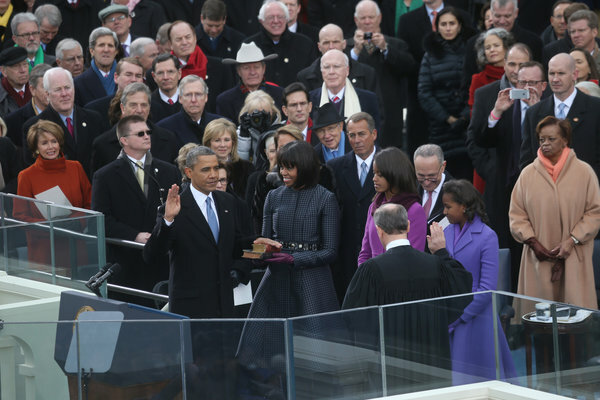 Mr. Obama renewed his oath of office with Chief Justice John G. Roberts Jr. on Monday. A view of the podium in front of the Capitol. The Obama family on the podium. 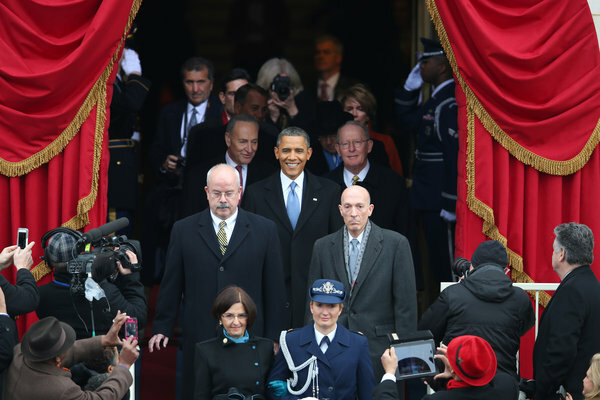 Mr. Obama greeted guests as he arrived for the ceremony. 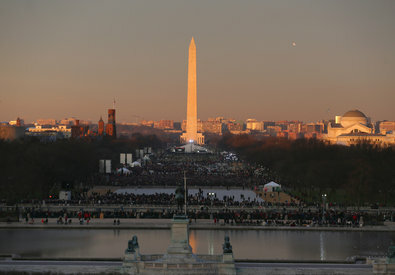 The crowd on the National Mall was expected to swell to an estimated 600,000 people. 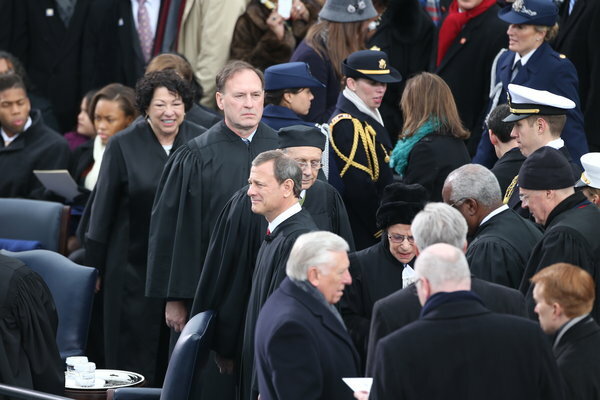 The justices of the Supreme Court arriving for the ceremony. 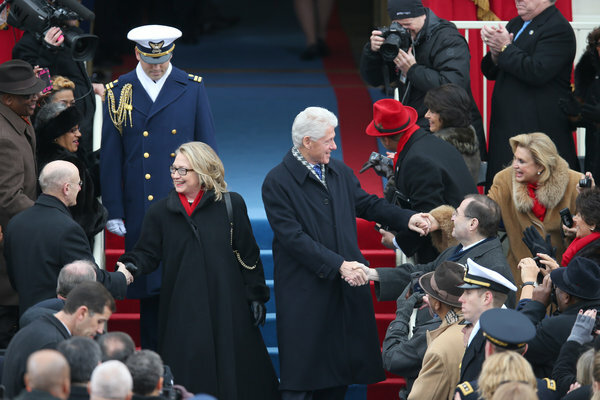 Secretary of State Hillary Rodham Clinton and former President Bill Clinton arriving. 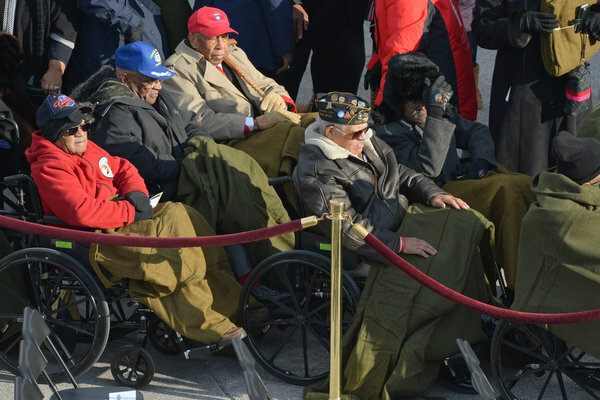 American veterans gathered on the Mall to view the inauguration. 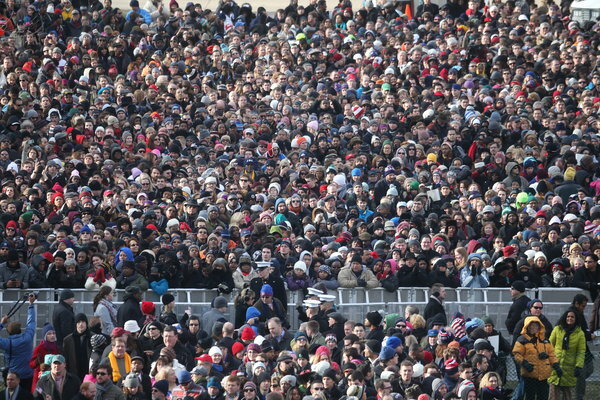 Spectators bundled against the cold made their way to the Mall. 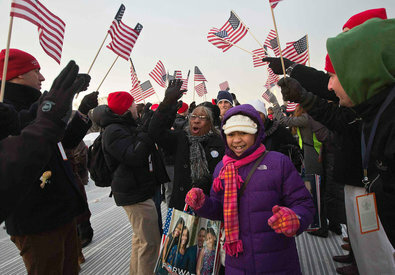 Some entryways to the Mall were lined with cheering, flag-waving greeters. 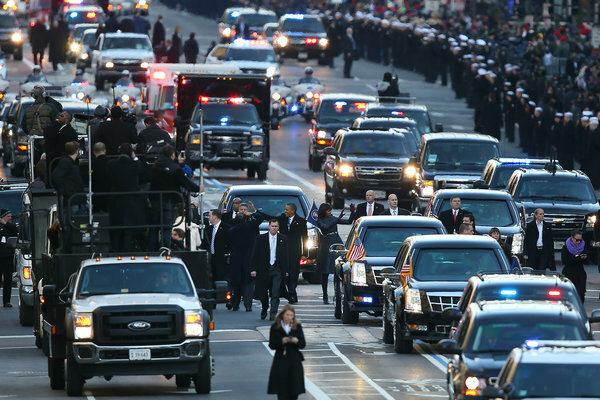 Mr. Obama and his family arrived for a church service on Monday before the ceremony. 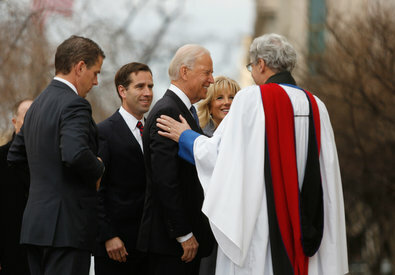 Vice President Joseph R. Biden Jr. and his family were welcomed to a morning church service. 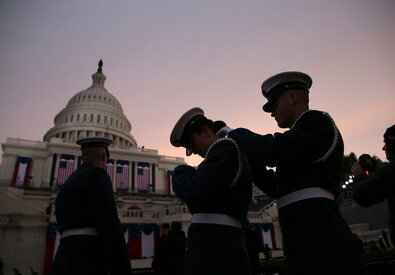 Members of the military prepared for their role in the inaugural ceremony in front of the Capitol. Tape marked the positions for the first and second families on the inaugural podium. Invoking the nation’s founding values, President Obama marked the start of his second term Monday with a sweeping call for “collective action” to confront the economic and social challenges of America’s present and future. What did you think of Obama’s address? across the Great Plains, then charging across the Rockies. told by our silent gestures moving behind windows. for twenty years, so I could write this poem. as mothers watch children slide into the day. so my brother and I could have books and shoes. the unexpected song bird on your clothes line. jutting into a sky that yields to our resilience. who couldn’t give what you wanted. 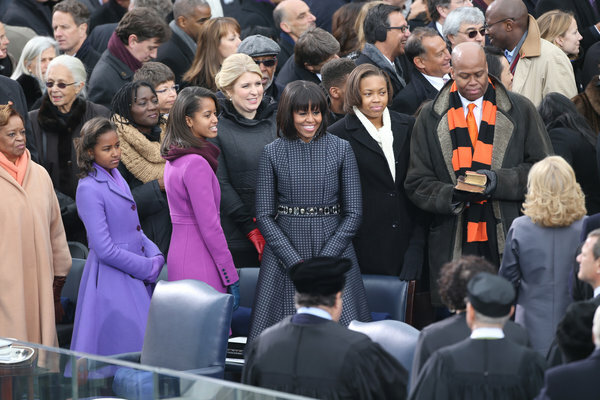 President Obama and his family arrived for a church service on Monday before his inaugural ceremony. 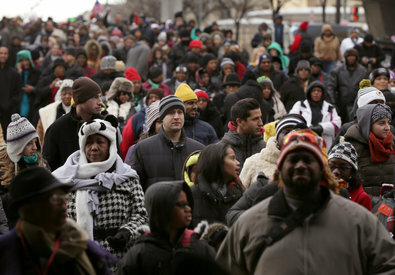 The crowd on the Washington Mall was expected to swell to an estimated 600,000 people. The place setting for Mr. Obama ahead of the inaugural luncheon in Statuary Hall at the Capitol. 11:09 a.m.: The president and his family are announced and seated on the inaugural platform, built by the Architect of the Capitol. 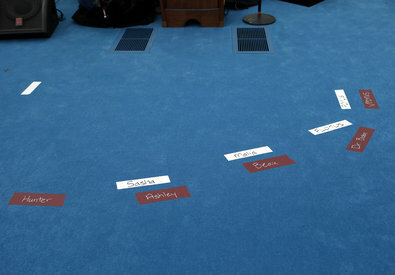 It holds some 1,600 people, including members of Congress, the Cabinet and the Supreme Court, the Joint Chiefs of Staff, former presidents Bill Clinton and Jimmy Carter and governors. 11:35 a.m.: Invocation by Myrlie Evers-Williams, the widow of slain civil rights organizer Medgar Evers, and the first woman and first non-clergy member to lead the pre-oath prayer. 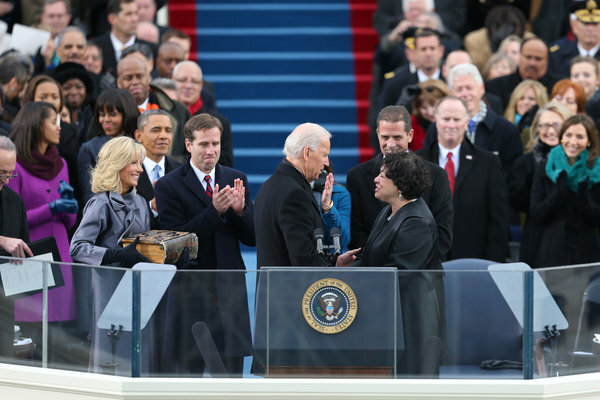 11:46 a.m.: Supreme Court Justice Sonia Sotomayor administers the oath of office to Vice President Joe Biden. 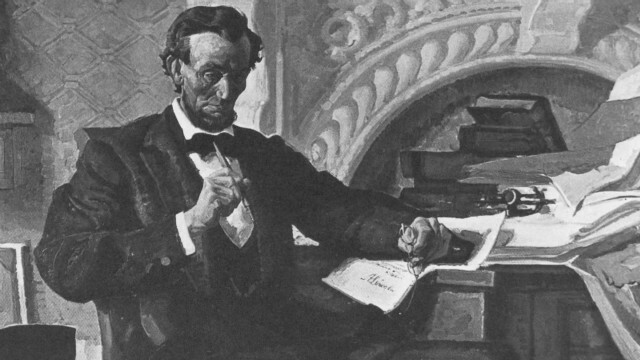 11:55 a.m.: Chief Justice John Roberts administers the oath of office to Obama, who will use two Bibles: the one used by President Abraham Lincoln in 1861 (which Obama used four years ago); and a Bible that belonged to Dr. Martin Luther King Jr. 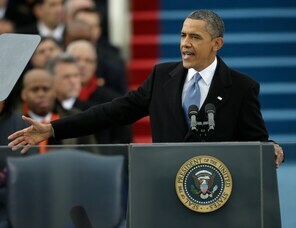 Noon: Obama gives his second inaugural address. 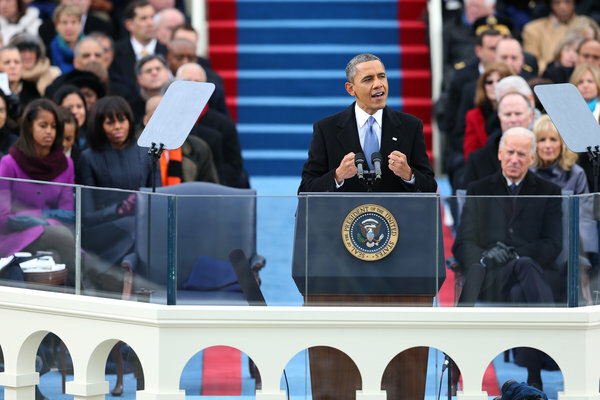 12:26 p.m.: A poem by Richard Blanco, the first Hispanic inaugural poet. 12:30 p.m.: The Rev. Dr. Luis Leon delivers the benediction. 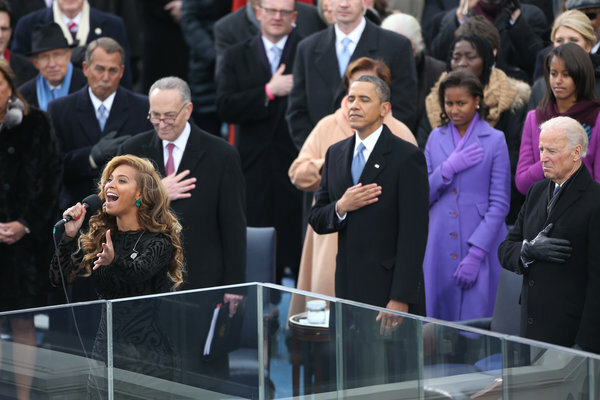 12:34 p.m.: Beyoncé sings the national anthem. 2:36 p.m.: After attending an inaugural luncheon in the Capitol, the Obamas and Bidens lead the inaugural parade down Pennsylvania Avenue from the Capitol to the White House. The event will take several hours and include thousands of participants from across the country. The First and Second families are issuing a call to action for all Americans to join together in service to honor the life and legacy of Dr. Martin Luther King, Jr. As part of the 57th Presidential Inauguration, the 2013 Presidential Inaugural Committee (PIC) is encouraging all Americans to participate in a National Day of Service on Saturday, January 1 – a tradition started by the Obamas at their first Inaugural four years ago. As part of this Day of Service, the Inaugural Committee will host a Service Summit on the National Mall, and is planning service events in all 50 states. In addition to the Service Summit, on Saturday the President, Vice President, and their families will also participate in service events in Washington DC. 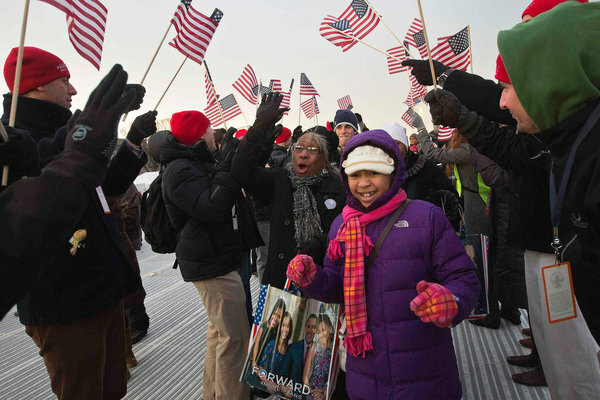 First Lady Michelle Obama and Dr. Jill Biden will host the Kids’ Inaugural for America’s children and families as part of their ongoing commitment to military families. 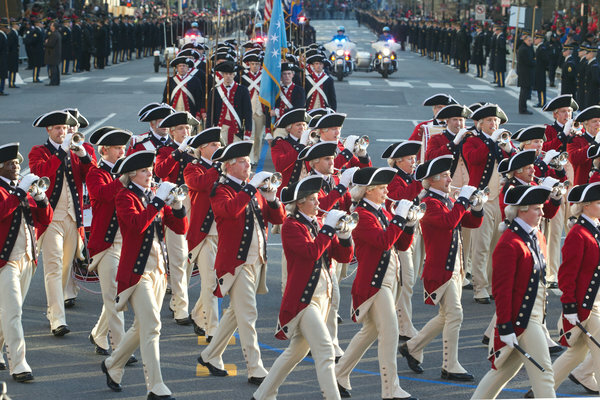 The concert continues a tradition they started in 2009 that builds on initiatives like Joining Forces by honoring and celebrating the service and sacrifice of our U.S. military as part of official Inaugural activities. 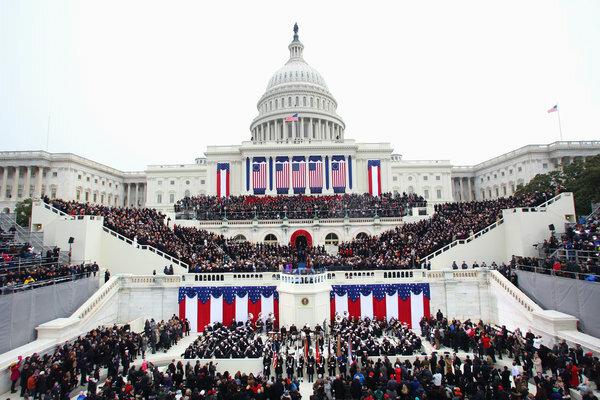 Historically, Inaugural Ceremonies are not held on a Sunday because Courts and other public institutions are not open. 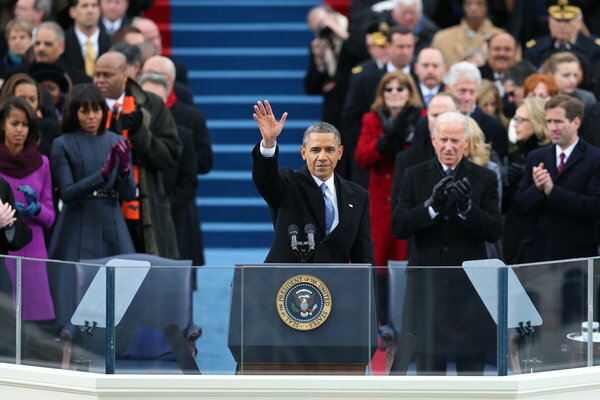 This year, in accordance with the requirements of the United States Constitution, President Obama and Vice President Biden will officially be sworn-in on Sunday, January 20, 2013. 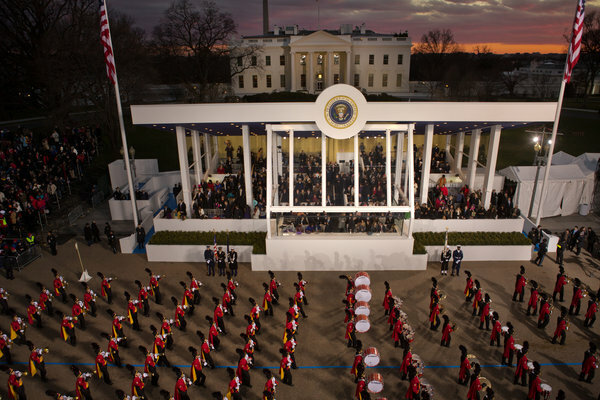 On Monday, the President and Vice President will be sworn in the traditional ceremonial swearing in ceremony at the U.S. Capitol that is open to the public. Note: Per tradition, the event is hosted by the Joint Congressional Committee on Inaugural Ceremonies and media credentials for this event are issued by the Senate Media Galleries. 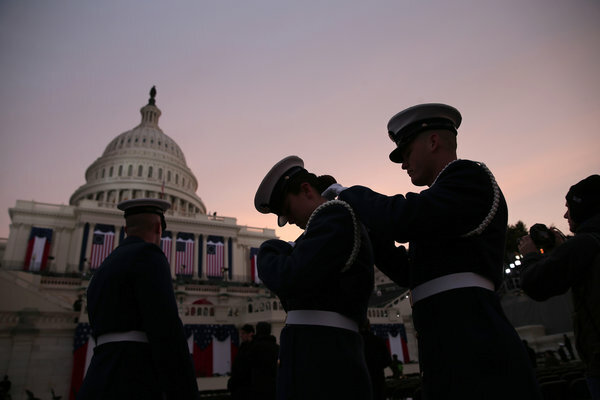 As he did at his first Inauguration in 2009, President Obama will host the Commander-in-Chief’s Ball to honor America’s brave service members and their families, a tradition started by President George W. Bush in 2005. Active duty and reserve military, Medal of Honor recipients, and wounded warriors and their spouses will attend. Troops from around the world will also be able to join the celebration virtually. 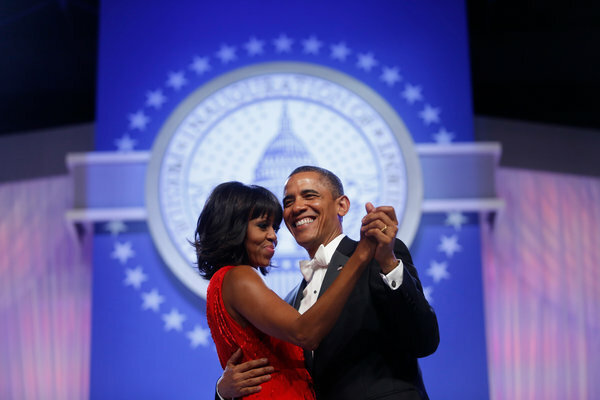 Americans across the country are invited to share in the celebration at The Inaugural Ball, a unified celebration for all Americans that will span every hall in the Walter E. Washington Convention Center. 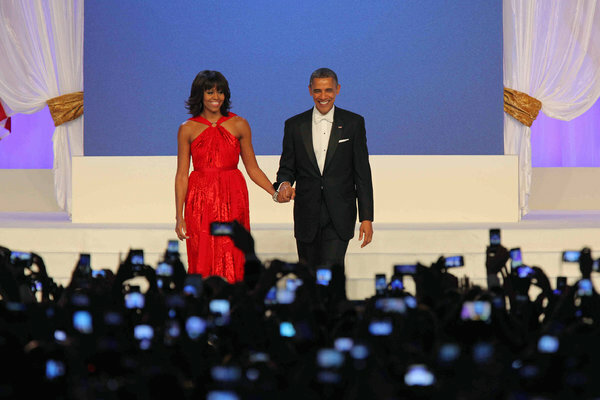 Although President Obama officially took the oath of office and started his second term on Sunday, the public festivities will be in full swing on Monday. 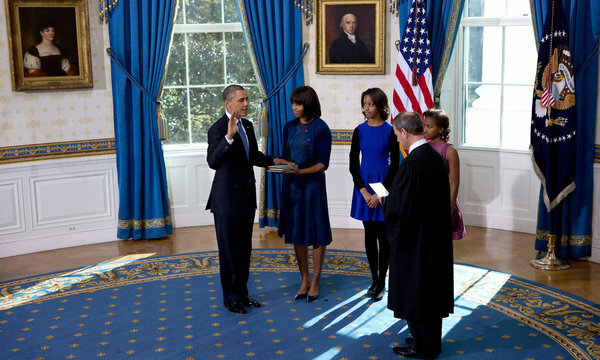 President Obama took the oath of office from Chief Justice John G. Roberts Jr. at the official swearing-in ceremony in the Blue Room of the White House on Sunday. President Barack Obama and Vice President Joe Biden on Sunday officially embarked on their second term, taking the Constitutionally-mandated oath of office in two separate private ceremonies inside their Washington, D.C., homes. 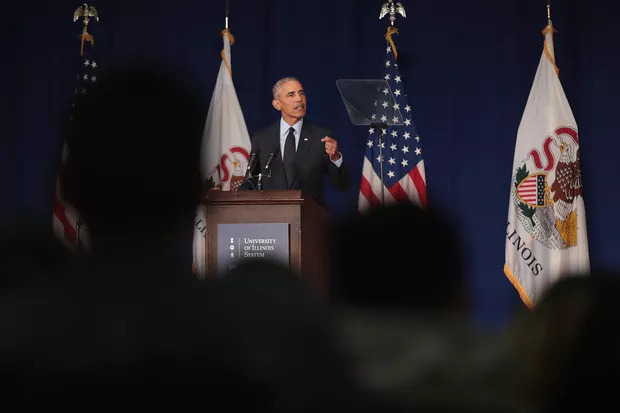 Shortly before noon in the Blue Room of the White House, Obama raised his right hand, with his left on a family Bible, reciting the oath administrated by Chief Justice John Roberts. 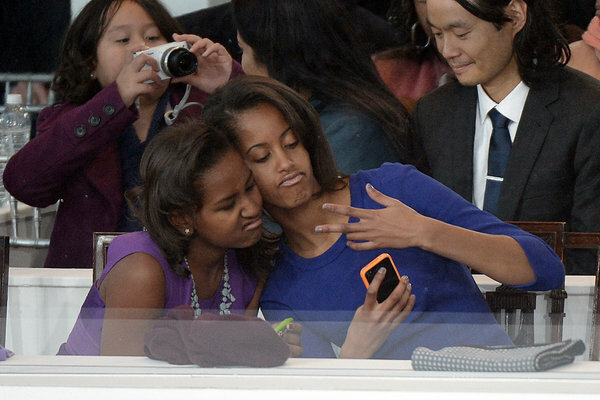 He was surrounded by immediate family members, including First Lady Michelle Obama and daughters, Malia and Sasha. 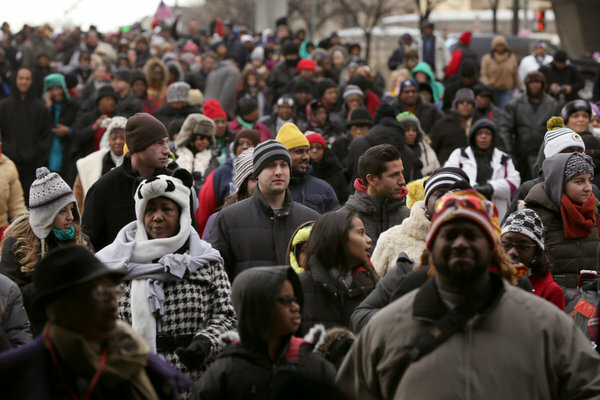 — While an estimated 800,000 people are expected to gather in Washington D.C. Monday to watch President Obama be sworn in for a second term, his second term officially begins Sunday. He will take his oath of office in a private ceremony. 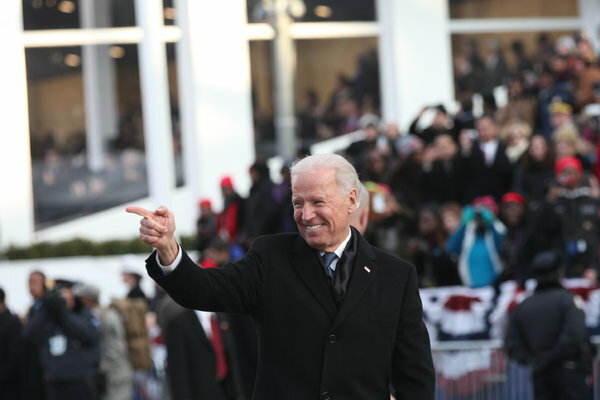 Vice President Joe Biden was sworn in on Sunday morning at the Naval Observatory. 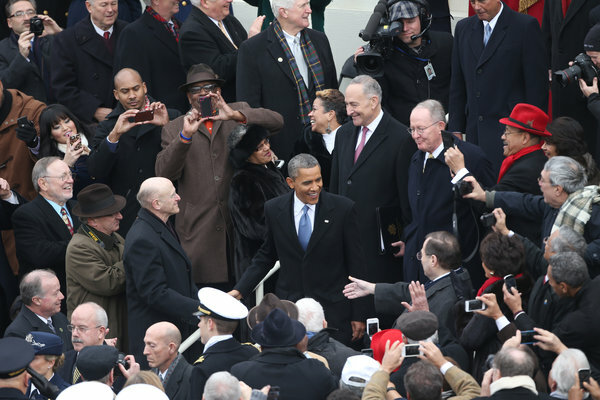 The second inaugural address is always more difficult than the first. When a president-elect first steps onto the national stage, he still enjoys a certain degree of innocence and hope. Americans are waiting to see if the new president will be different. When a new president delivers his speech, voters don’t yet have a record that might make them cynical. But by the second term, voters are familiar, and often tired, with the occupant of the White House. Even though they liked him more than his opponents, the president has usually been through some pretty tough battles and his limitations have been exposed. It becomes much harder to deliver big promises, when the people watching have a much clearer sense of your limitations and of the strength of your opponents.